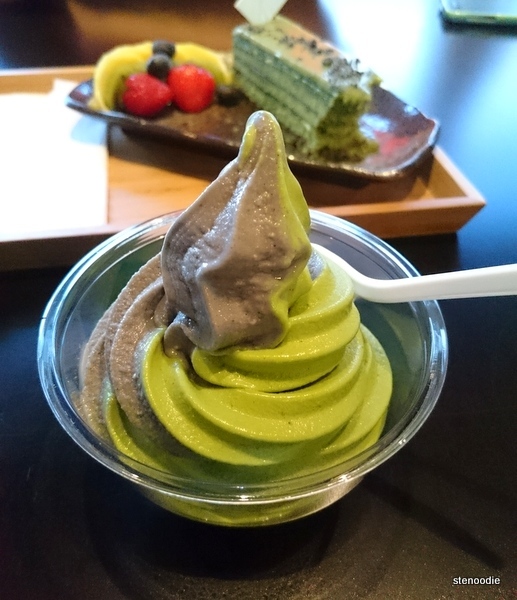 Oh hello, brand new matcha dessert cafe in Markham! 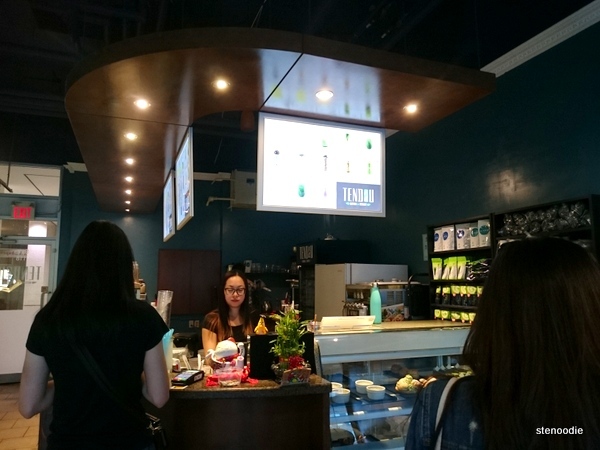 Tendou Matcha & Dessert recently opened in Markham at Highway 7 and Courtyard Lane (same plaza as Gal’s Sushi and Dessert Kitchen) to excited matcha fans all over the GTA. Ice cream cones, matcha-flavoured soft serve, and desserts of this type have been the rage in Toronto as of late and ever since pictures of Tendou have been popping up on Instagram, a lot of foodies have been eyeing this place and needing to come check it out. 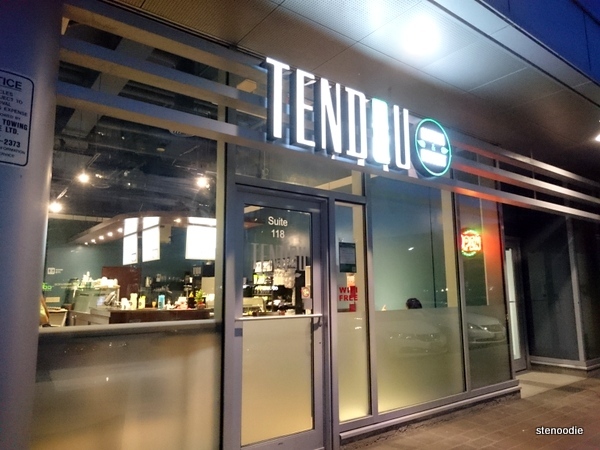 Tendou Matcha & Dessert is currently in their soft opening stage (at the time of writing) and still experimenting with their menu and what and how to serve their items. 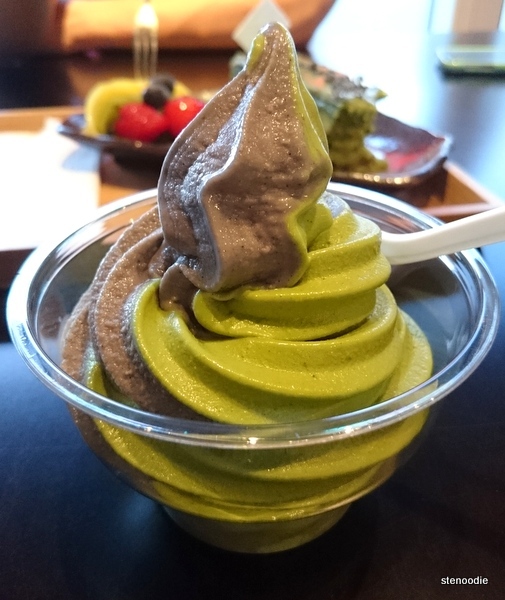 At this time, they have many drinks made with matcha, desserts with matcha, and soft serve matcha too. We were able to try their Tendou-style Matcha Opera Cake and Black Sesame and Matcha Swirl Ice Cream in a Cup to share among the three of us. I was so excited! We had to wait a few minutes for the black sesame to be ready from their soft serve machine, but that was fine with us. 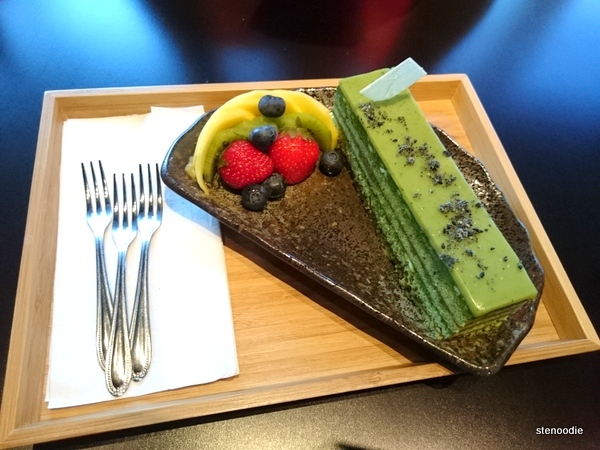 The Tendou-style Matcha Opera Cake was outfitted with some fresh fruit on the side (which also took a few minutes to to be prepared by their staff before being served). It was a really nice presentation of cake and fruits served on a plate and on a wooden plate. 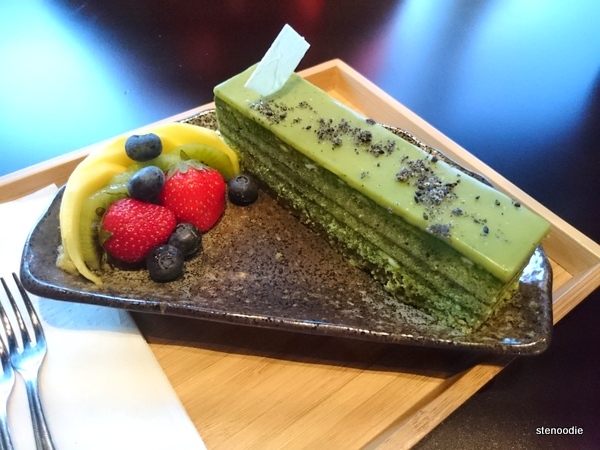 At first bite, the Matcha Opera Cake was a little dry — the cake itself — but the matcha mousse on the top really topped to moisten things out. The matcha texture and flavour was definitely there. 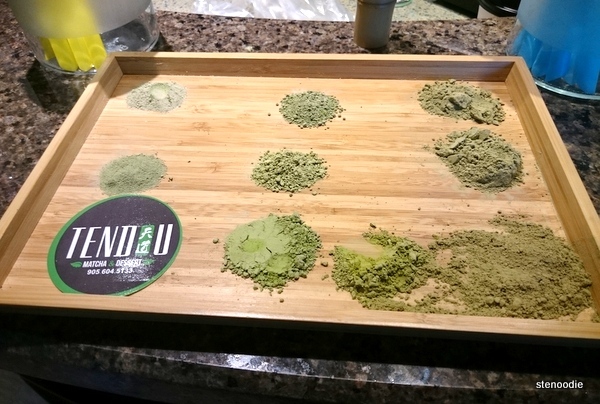 It was real matcha! The top of the cake was covered with some sesame bits. Over time, the cake tasted more and more sweet. This was a great cake to share with friends as it would be too much to have for one person. Cute little tray; perfect treat to share with a friend or two! The Black Sesame and Matcha Swirl Soft Serve came in a cup (or you can ask for it in a cone) and looked so good! For $4.50, it’s fairly decent considering what most places serve for matcha and black sesame soft serve nowadays. The Matcha Soft Serve was rich and slightly bitter; what authentic matcha should be like! It was a little thick too and rich. The Black Sesame Soft Serve was the same way; rich and authentically black sesame taste. Yum! I think the machine didn’t even distribute the black sesame soft serve evenly though because there was more matcha ice cream than black sesame in our cup. The table next to ours had a more even distribution. They are open from Tuesday to Sunday noon to midnight! 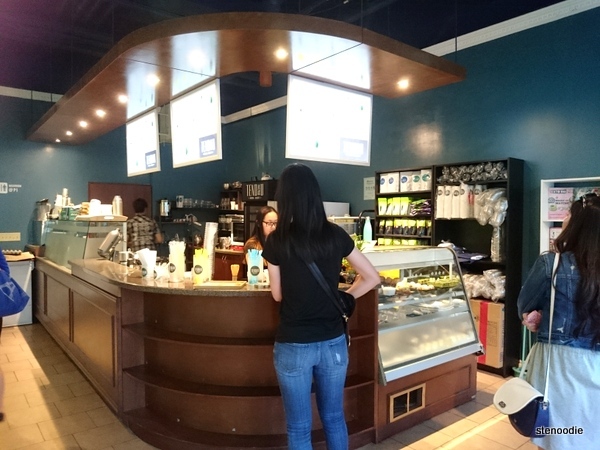 There are a couple of tables and stools for you to dine in to enjoy your treats, but Tendou Matcha & Desserts wants more of their customers to take out their treats since it is a fast casual type of cafe and you pay at the counter. They provide free wifi too. This entry was posted in Food and tagged 3621 Highway 7 E Unit 118, Black Sesame and Matcha Swirl Soft Serve, Black Sesame Soft Serve, dessert places uptown, food blog, foodie, free wifi, Hwy 7, Markham, Markham dessert, Matcha Opera Cake, Matcha Soft Serve Ice Cream, new matcha dessert place markham, restaurant review, Tendou Markham reviews, Tendou Matcha & Dessert, Tendou matcha reviews, Tendou-style Matcha Opera Cake, uptown matcha soft serve places, where to get good matcha ice cream Markham. Bookmark the permalink.